Cambridge, 1963. unbound. 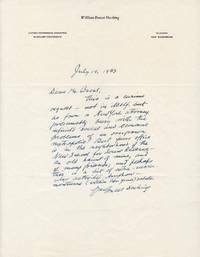 1 page, 11 x 8.5 inches, Cambridge, MA, July 10, 1963, responding to a New York City attorney who has requested his autograph, in full: "This is a curious request -- not in itself, but as from a New York attorney, presumably busy with the infinite social and economic problems of an overgrown metropolis. But your office is in the neighborhood of the New School for Social Research -- an old haunt of mine, and of many friends; and perhaps this is a bit of extra-curricular activity. Anyhow -- morituras (within few years) saluto." Also included is an unsigned 3.5 x 5-inch black-and-white snapshot dated September 1962. Fine condition. American idealist philosopher at Harvard University.